I hope you all had a wonderful New Years!!! I mentioned that me and my daughter went to the casino NYE, it wasn’t too bad. After we got lost getting there (totally my fault), we made it there by 11:50pm so we got a few turns on the slots before the countdown. We went to Indiana Casino Live in Shelbyville and it was PACKED!! My daughter is 22 and she’s never been before and she thought it would be neat to go on NYE. So, I took her straight to the penny slots, so she could get a feel of what they were like. A few of the machines I had to make her get away from because she just started pushing buttons, ie. MAX BET, lol. Well, at any rate, all’s well that ends well, we both broke even. No loss, no gain, no big deal. Since my mission in 2014 is a “Lifestyle Change” I wanted to share a few of the ideas I’ve picked up from Pinterest, @Mankofit, @dashmalove, @stacie_thetrainer (all from Instagram) and of course my daughter and some googling here and there. I follow them on their blogs or through Instagram for their exercise, eating healthy habits, and motivational advice. SOOO WRONG!! I know how stupid it sounds, but when you’re depressed and desperate, you think that you’re thinking logically and rationally, when you know deep down that it’s just plain destructive. Not only have I dieted a million times but I’ve also been on several different anti-depressants as well. I mean I’ve suffered from depression, migraines, anxiety, PTS, insomnia, sleep-apnea, and anything else that comes along with depression and obesity. I have high blood pressure and the ever increasing “belly fat” that us, ahem “older/middle-aged” women suffer from. But, it’s all good, because “Lifestyle Change 2014” is going to change all of that J. NO JOKE. Yeah, that sounds like such a lofty idea, you say, just think you’re going to change and it’s going to magically happen overnight…No, I don’t think it’s going to magically happen overnight, because all of this fat and total mind destruction, that’s been going on for years, didn’t just happen overnight, not even just last year. I mean this has been going for decades (NO LIE). I’ve been fighting this battle for YEARSSSSSS! I’m getting teary-eyed thinking of all those years wasted being unhappy and putting on a brave, happy face for my kids, when deep down inside I’ve been dragging around this ball-and-chain just in the background. BLAHHHH, it makes me angry even thinking about it. I can tell you, that the ball-and-chain has reeked havoc in my life, many lost relationships and many lost opportunities. I’m going to use this little mental image of me just sweeping the old crap out of my mind and out of the door, instead of under the rug, for me to stumble over later on. Moving on, back to a few eating tidbits. I started taking a multivitamin every morning. I bought ONE-A-DAY Energy, that has caffeine added. I will tell you that most things I’m going to recommend will be because they’re a trusted brand or because I caught it on sale, lol. I am a penny-pincher for sure and I probably won’t buy it if I don’t have a coupon or if it’s not on sale. Remember, I’m trying to save money and pay off debt this year as well. The ONE-A-DAY does make me a little jittery though, but I’m hoping I get used to it. I’ll start my morning with either a smoothie that I made the night before or protein/nutrition bar. And to make sure I get all of the 64 ounces of water a day, that is recommended to drink, I drink water between every bite that I eat, nerdy, but it works. 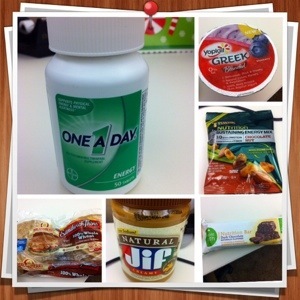 I pack a my lunch bag with several snacks that I eat on all through the day. I like Yoplait’s Greek yogurt, blueberry is my fav. I’ve tried the Dannon’s Greek low-fat, and bleccckkkkk, it’s way too sweet for my liking. And it has aspartame in it, and I avoid that and any other “fake sweetener” because I’m one of those people that thinks they cause cancer. Please don’t take anything I say as the gospel truth because I won’t quote you some scientifically proven fact, just my opinion. I also keep my desk drawer packed with the protein/nutrition bars in case I don’t like what they’re serving upstairs in the cafeteria. I’m currently eating Simple Truth Peanut Butter Extreme and it’s very good, if you like peanut butter, and you guessed it, they were on sale at Kroger for 89 cents apiece. Anywho, I also eat, Planter’s NutTrition energy mix with my yogurt, because I love the combo, it tastes like a parfait and “Everybody loves parfait”-Donkey from Shrek, hahahaha. Gotta love it. I also pack fruit, Brownberry sandwich thins (wholegrain), and Natural Jiff peanut butter. From what the experts recommend, I read labels and I’m looking for low-fat, low-sodium, high fiber, high protein, low calorie per serving, and good carbs. But, don’t quote me, because you can’t believe everything you read on the internet and definitely not in this blog, lol. I’m going to go workout today when I get off of work and get my cardio and strength training in. I’m going to strive for 4 workouts a week, Monday & Tuesday, and Thursday & Friday, I mean why not, I don’t have a social life so I can go to the gym whenever I want practically. So, there you have it, just a little more explanation on my goals for this blog this year and my “LIFESTYLE CHANGE 2014”. Every time you read that I want you to hear it in a ‘movie announcer’s’ voice and imagine the little minions saying “DUN…DUN…DUN!! !” afterwards, hahahahaha. That will make me laugh every time.